Your host Tiki Tony Working Hard Behind The Bar To Make His Guest Feel Right At Home. (And also working hard to make his guest feel nothing). 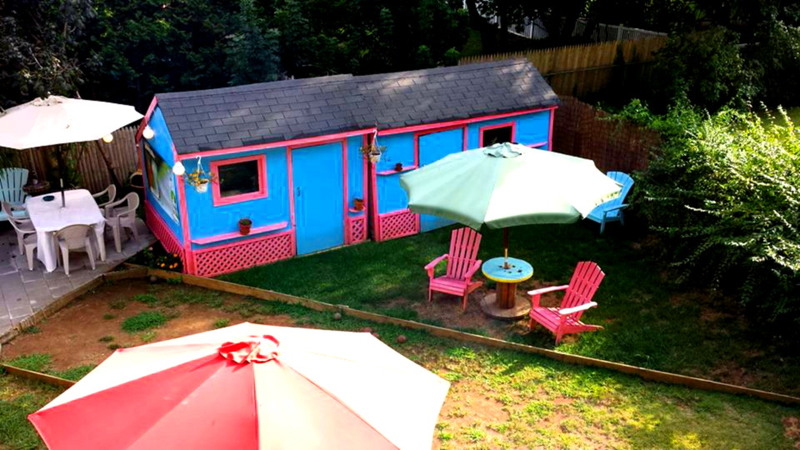 View of the facilities from the west end of the property, but east of the new addition to the ammenities, known as tiki bar #2; and south of the winter storage facilities for the tropical folliage, and north of the new kitchen sink; with running water too. 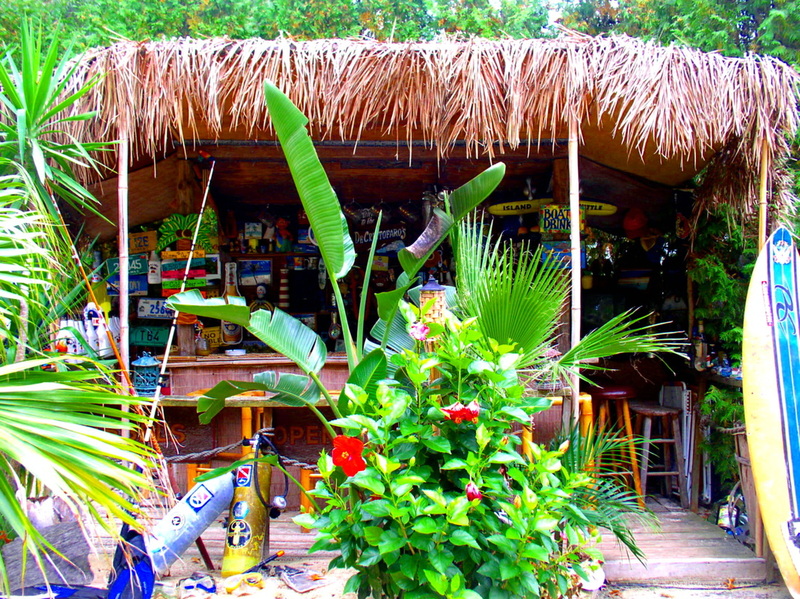 This is a picture of the original Tiki Bar #1 as seen without its addition to the east of it. This is a picture of the addition to the east end of Tiki Bar #1. This is also the location that a buried chest was found under the sand recently. (She blamed it on the Goombays when she took off her top and covered herself with sand; all the while hoping that someone would find her buried treasure chest). 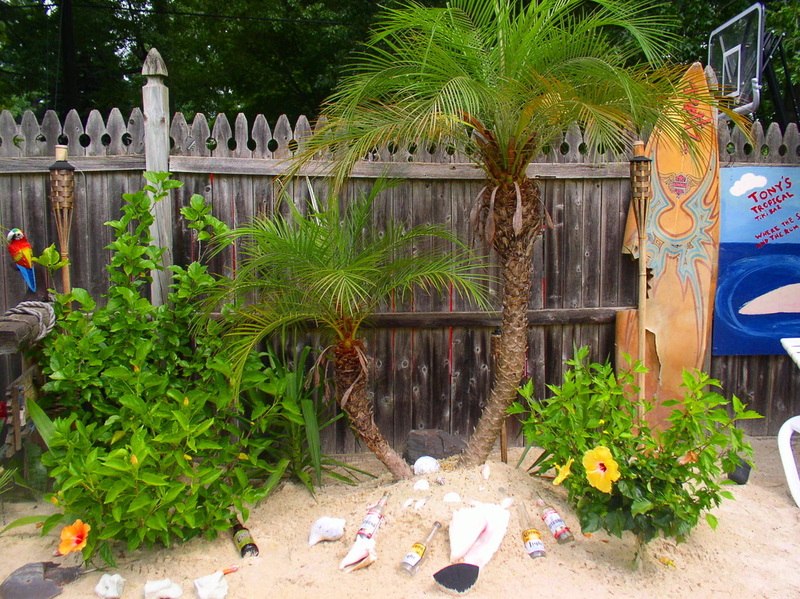 This is a picture of the newly built Tiki Bar #2.(est. 4-2008) It comes equipped with cooking and kitchen facilities that are enclosed to the rear of the bar(not pictured). 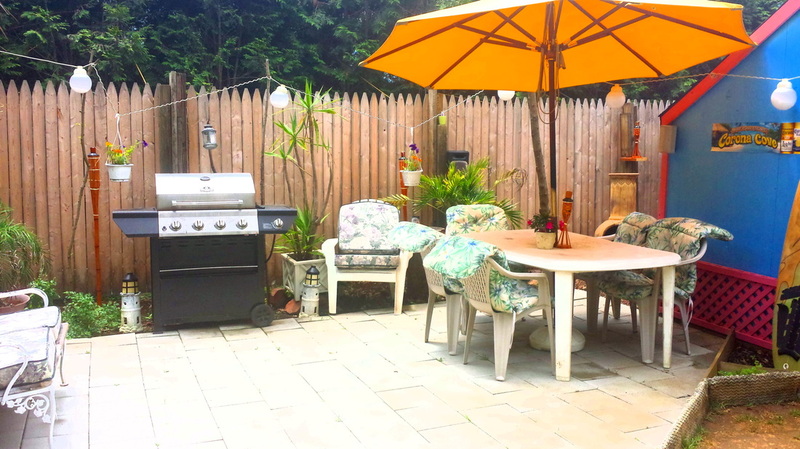 The facilities include in the back room, two gas grills, cooking and serving area with serving counter, sink with running water, two refriderators, flat screen TV, a built in lobster & crab tank, and a 16 foot bar counter top with comfortable seating for all. 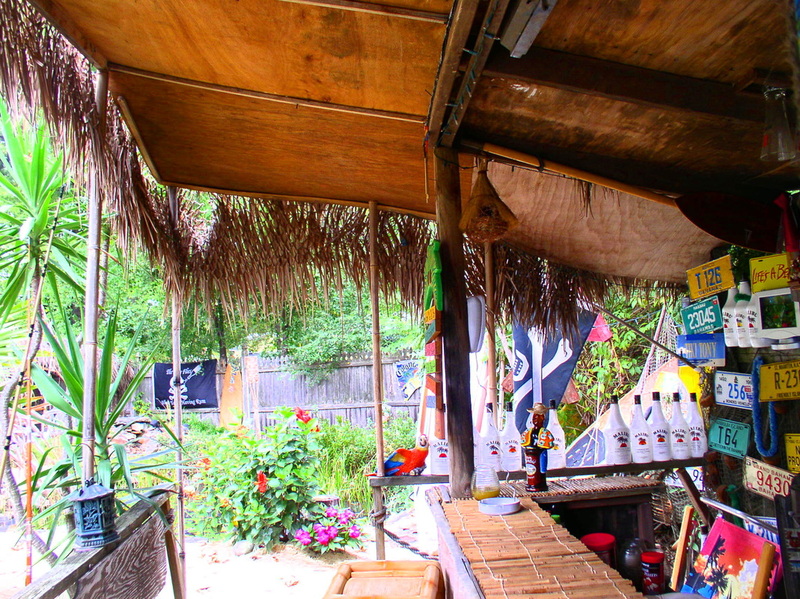 Even though this is newer and better, Tiki Bar #1 still holds a special place in our hearts as the original Tony's Tropical Tiki Bar. 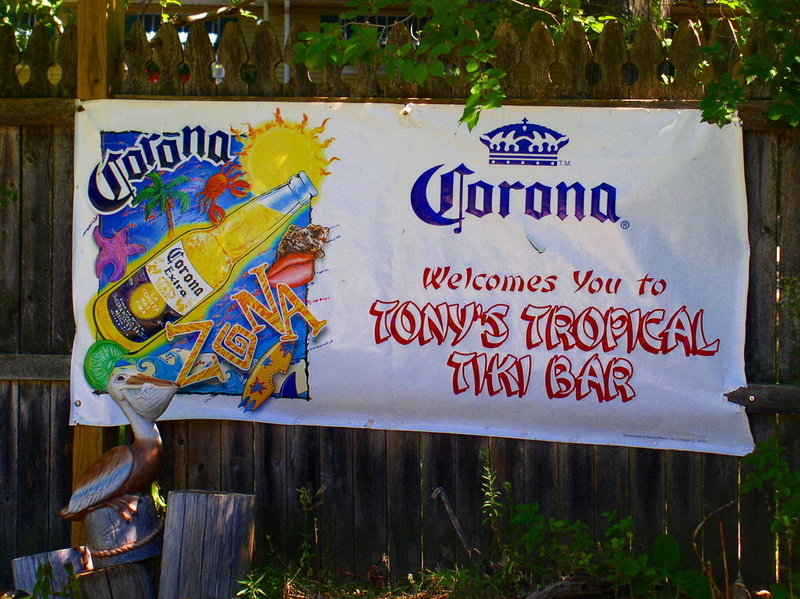 Like a child who just had a newborn sibling welcolmed into his life we now call the original Tony's Tropical Tiki Bar, Tony's Tropical Tiki Beach Bar. (It makes the bar feel special and keeps him from getting jealous of his newly built sibling) This is the socializing area that most people gravitate to. Also in the new bar is one of the greatest bar games in the islands! 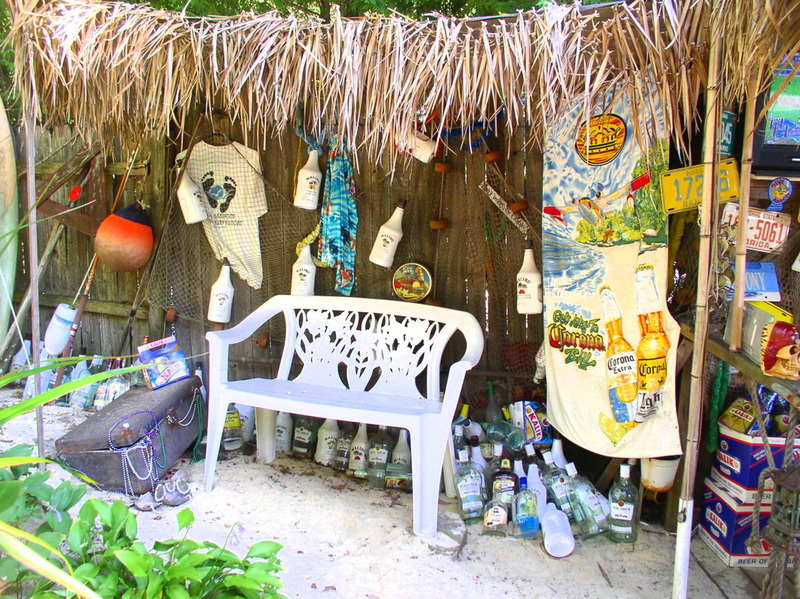 Bahamian ring toss. If you look close you will see how simple it is. A string, a hook, and a ring. The rules are also simple but if you need them the rule book is hanging on the pole under the hook! After a rum punch or two the rules won't matter anymore to you though so - don't worry- be happy!!! And here a little Bahamian ring toss in action! 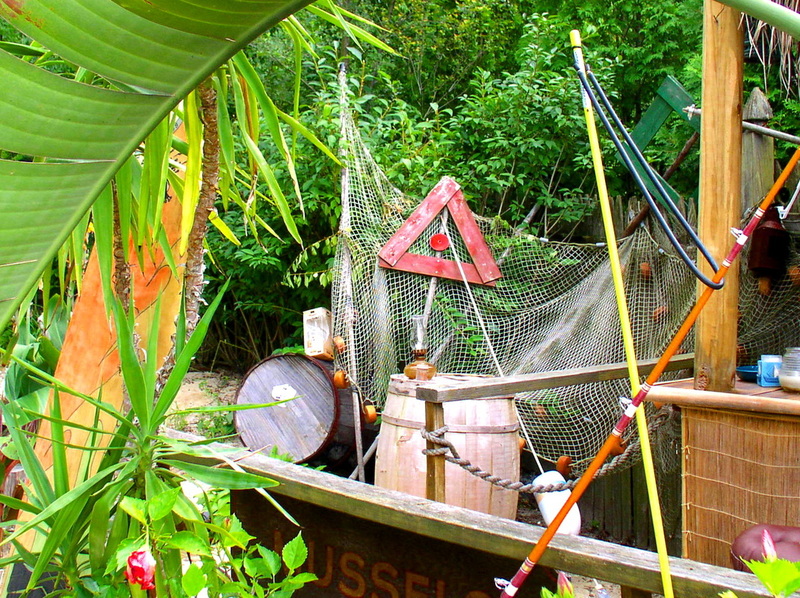 In the above picture you can see the 2010 addition to Tiki Bar #2 which is an 8 foot extension of the bar to house a lobster tank. Below is a close up of the tank. We don't close in the winter. We just ENclose. 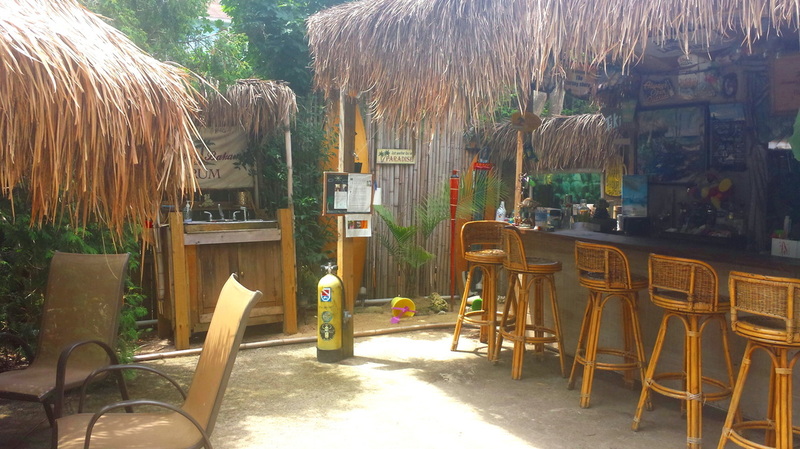 We don't close here in the winter months, we just ENclose; as you can see here in our picture of our winter tiki bar which is completely enclosed and wood stove heated to provide goombay smashes to all; 365 days a year. This is as it says the front end of the beach area. This is where many social gatherings of barefoot people sat in these very sandchairs with their feet buried beneath the sand while they discussed how to solve the problems of the world; and how to solve the problems of others; and how to solve the problems of government. Oh, did I mention the RUM? What problems? NO PROBLEMS MON. 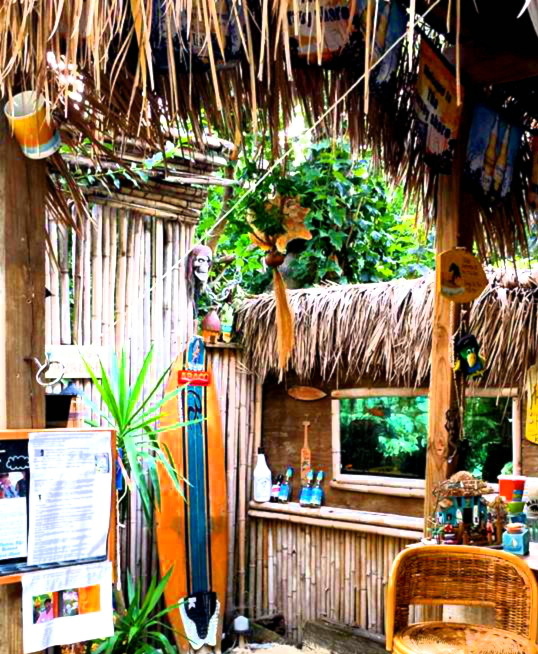 This is a picture from the seating area of Tiki Bar #1. 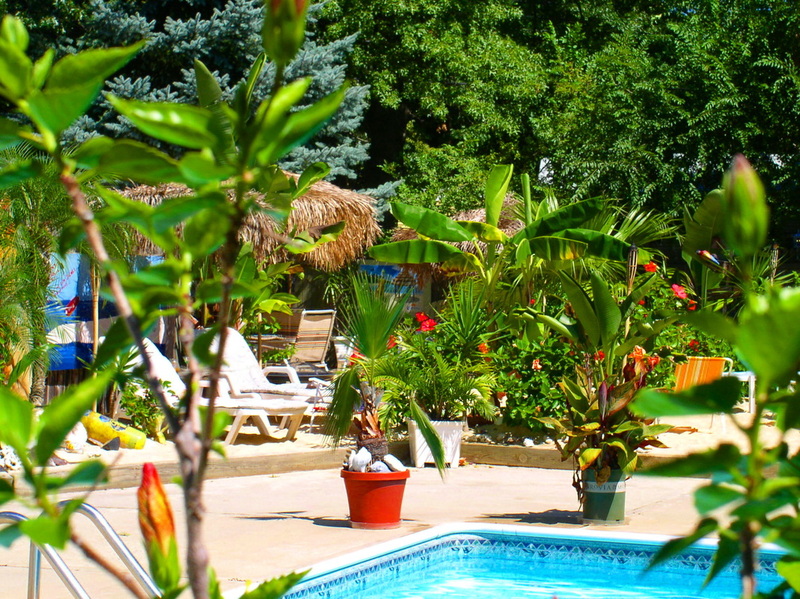 It is furnished with cable TV along with everything else that you might want or need. (oh, did I mention the RUM?) It is the location that many patrons gravitate to upon arrival; where they plop down on their asses from arrival till departure, which sometimes could be from dusk till dawn. (Their asses do get up to relieve themselves throughout the evening; a requirement of the establishment). Picture of cabana at back end of beach area. Taken from under thatch umbrella dinner area. This is an ideal location to drift back to with your significant other. Or if your significant other is busy it is an ideal location to drift back with another patron. It has that romantic amount of lighting during the evening hours to give you the idea that you are with the most beautiful mate that there can be. And when combined with the after dinner drinks they will be an 11 on a scale of 1-10. Oh, and did I mention the RUM? 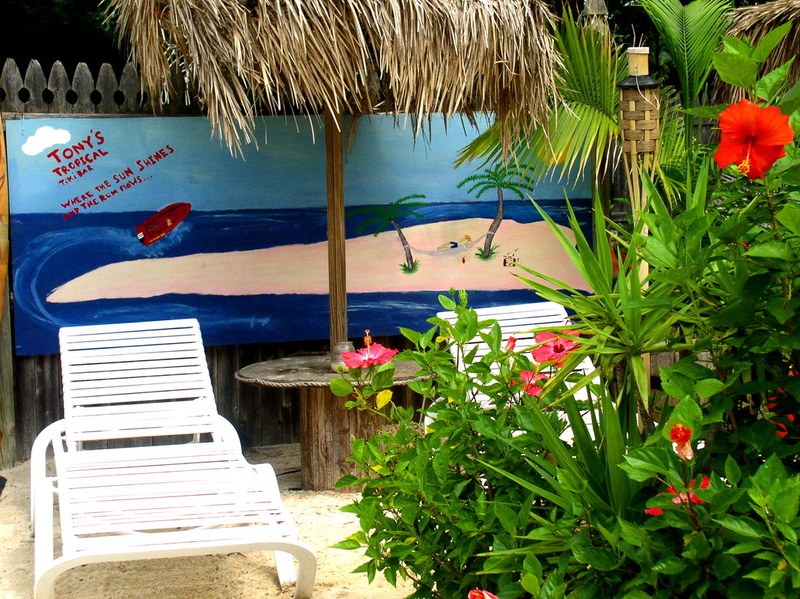 After Tiki Tony's rum punches they'll be up to a 50 on a scale of 1-10. In the distance you can see the hammock and rope swing. 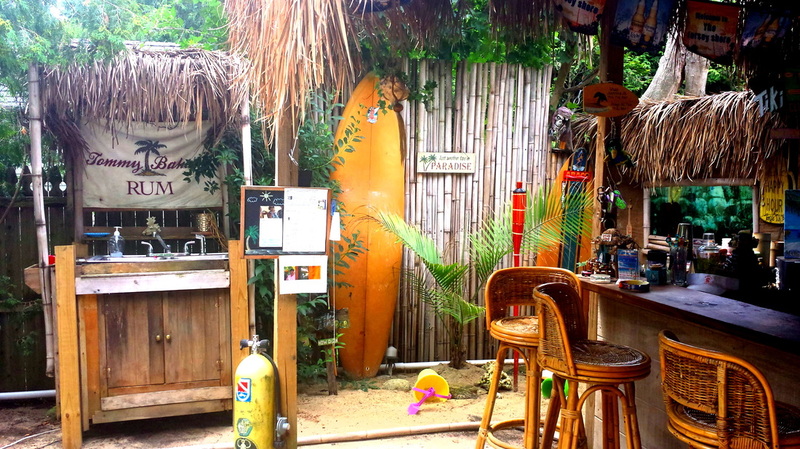 This is one of Tiki Tonys favorite spots at the tiki bar. There have been many nights that Tiki Tony watches the stars in his hammock and closes his eyes; only to open them to bright sunshine. Blame it on the rum but its not such a bad thing. Below is a closer shot of the swing area. 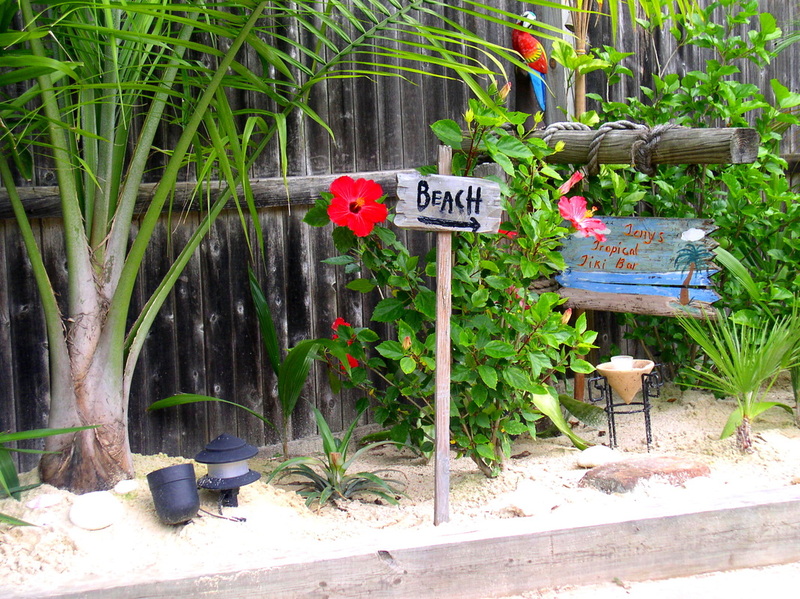 This is a little private getaway area to sit back and listen to tropical music with your thoughts; or to read a good book. You are sitting in a chair made of bamboo; while being surrounded by walls of bamboo. 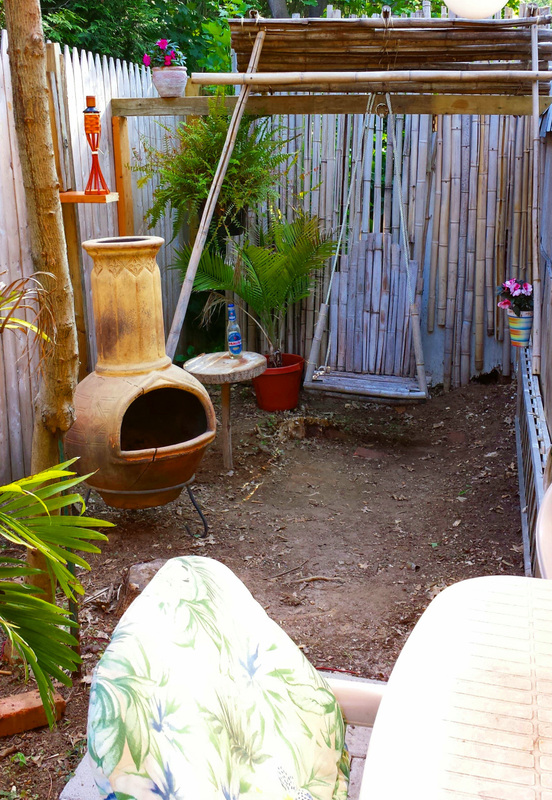 Bamboo walls are behind you as well as directly across the patio in front of you. Be it day or night a perfect spot for some alone time. Also has a large chimenea that can be lit if you'd like. However if you choose to be with others in this area there are also cushioned chairs for all to enjoy the atmosphere. Below is a picture of the bamboo walls that you look at while you hang in the bamboo swing.